A regular membership is entitled use of the entire facility including the dining room, bar, swimming pool and surrounding area and the golf course. This membership carries voting privileges. A membership for those under the age of 40 years. Membership fee and 25% of dues paid are applied to future purchase of regular membership. This membership carries voting privileges. The member cannot be married, in a spousal relationship, or have any children under the age of 25. Anyone with the member is considered a guest. This membership carries voting privileges. Social members are entitled use of the dining room, bar, swimming pool and surrounding area. Businesses may hold social memberships and up to 5 designated persons actively employed by said business may use the Clubhouse and pool. 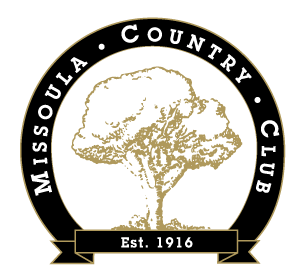 A non-resident member is one whose actual permanent residence is more that one hundred (100) miles from the Missoula Country Club by the most usual and direct route of travel. A non-resident member is entitled use of the entire facility including the dining room, bar, swimming pool with its surrounding area, and the golf course. Golfing is limited to 30 rounds of golf per membership each calendar year. If more rounds are played the applicable guest green fee will be charged for each round. Charges for cart stalls and trail fees apply to those members who own a golf cart and store it in the cart barn at the Club. Two members may jointly own one cart and charges are applied accordingly.